Overview –Kolossus FleKs Power / Ground Wire consists of oversized, fine stranded, tinned Oxygen Free Copper (99.99%) conductors. 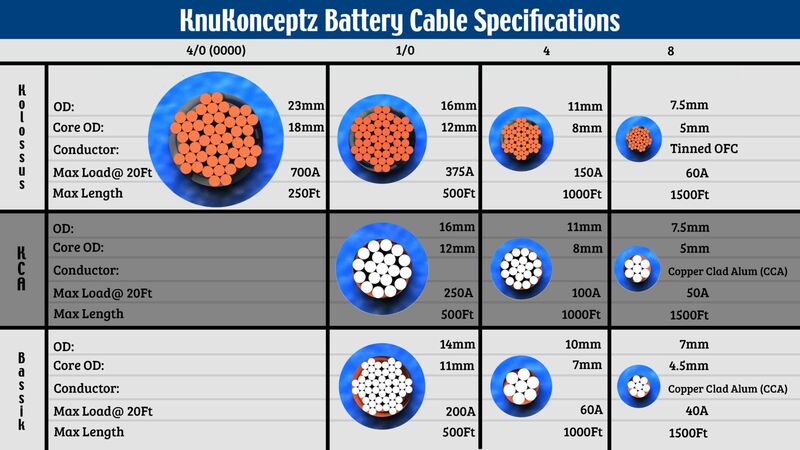 By design, we increased the surface area of our cables to allow for higher current loads. Applications include marine and mobile audio. The FleKs Kable features an ultra flex matte PVC jacket that makes it bend to any radius and stable in temperatures from -40C to 105C. Colors available include Black, Blue, and Red. Notes –While our Kolossus FleKs Kable is oversized, most manufacture’s terminals will still fit our cables. The tinned OFC will resist oxidation thus making the cable suitable for marine or any high moisture applications. How do I order 18 feet of cable? We sell this cable by the foot. To purchase 18' enter "18" in the QTY box and click add to cart. This number represents the total number of continuous feet you want to order.